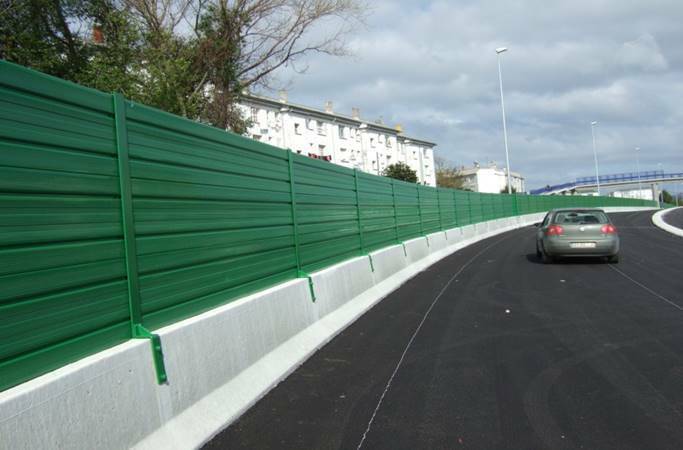 Panacor 2000 Noise Barriers is the registered product of PANACOR XXI S.L., Spain, Panacor began manufacturing Noise Barriers in 2004 in its native country of Spain and has since then expanded its operations to all over Europe. Panacor Noise barriers are tested and approved in accordance with European Standards EN:1793 and EN:1794 and are CE Certified as well. The Panacor systems are installed in over 10 countries worldwide with India being its latest addition. Although it is impossible to eliminate Noise Pollution the PANACOR Systems are designed to successfully control and reduce Rail and Road Noise Pollution bringing them down to acceptable limits. PANACOR Metallic Acoustic Panels provide a Cost Effective solution for your Noise Abutment needs with proven performance and tested physical properties. Providing an Effective Long Lasting Solution. PANACOR MT-15 Transparent Panels are ideal for areas where transparency is of utmost importance. The Barriers are Reflective Type and Provide Excellent Noise Isolation. In Locations where it becomes Imperative to Provide Certain Amount of Transparency to the Barrier Wall the PANACOR Hybrid System which offers both Transparent as well as Metallic Panels is ideal. as a mandatory requirement to be placed in the European Union. The EN-1793 and EN-1794 standards have been adopted by many countries outside the European Union as well. The PANACOR Systems are CE Certified and comply with the standards set out in EN-1793 and EN-1794.